Here Lakeland in simple, direct prose makes a forceful case why being a Catholic in our contemporary postmodern, globalized world requires political commitment and what Roman Catholics can do for American society. Try to define a layperson without using the word not: cannot preach or say mass, is not a priest, is not in a position of leadership in the church. This generally negative or passive understanding of the laity was epitomized in a statement of Pope Pius X: "The one duty of the multitude [i.e., the laity] is to allow themselves to be led and, like a docile fl ock, to follow the Pastors." The Second Vatican Council, with its emphasis on the priesthood of all believers rooted in baptism, changed all that. Yet, writes Paul Lakeland, "many of our bishops and not a few of the lay members of the church are attracted to a dangerously incomplete vision of Catholicism...one that sidesteps the major themes and key insights of Vatican II." In Catholicism at the Crossroads, he teases out themes fi rst developed in a much more formal way in his prize-winning The Liberation of the Laity. In his new book he is "talking to ordinary Catholics in language that requires no special expertise in theology and does not necessitate constant reference to a dictionary." Baptism, says Lakeland, not priestly ordination, is the basis for all mission and ministry, and the mission of those baptized into Christ is to be the sacrament of God's love in a world rife with violence and brutal inequity. The specifi c mission of the laity is to the world, whereas the mission of the clergy is to the household of the faith. Yet lay people can't leave "church business" exclusively to the clergy, and the clergy can't leave the church's "worldly mission" exclusively to the laity. The key to resolving these overlapping responsibilities is by becoming an adult church, an open church in an open society. In pursuing this goal, Lakeland develops "ten steps toward a more adult church." 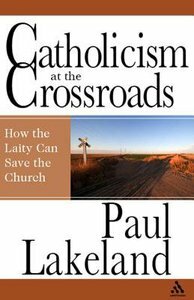 About "Catholicism At the Crossroads"
Paul Lakeland is professor religious studies at Fairfield University. He is the author of many books, including "The LIberation of the Laity." Introduction: Stepping Up To The Plate; Part 1: The Nature Of An Adult Church; 1. Prayer, Discernment, And Disagreement; 2. The Role Of The Laity; 3. What Is So Important About Accountability? ; 4. Accountability And The Laity; 5. Accountability And Sexual Abuse; 6. An Open Church In An Open Society; 7. Ten Steps Toward A More Adult Church; Part 2: The Work Of An Adult Church; 8. The Laity And The Mission Of The Church; 9. An Adult Church Engages The World: The Question Of Globalization; 10. An Adult Church Engages The World: The Question Of Culture.